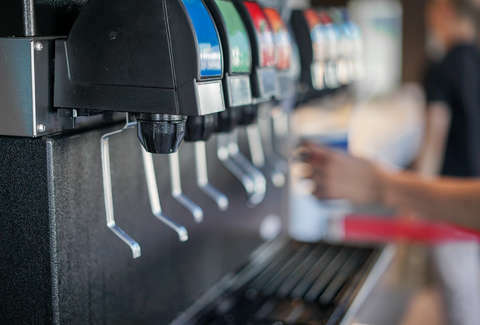 It's hard to gauge whether filling up your water cup with soda at a fast food restaurant constitutes a crime. While the bar for falling afoul of the rules is set dangerously low at your local Arby's, it turns out that not paying for a soft drink can get the cops called on you, especially if you vehemently defend your right to drink the sweet, stolen liquid. A Montana man who thought he had gamed the system with a sly refill found himself frisked at an Arby's when a restaurant employee noticed his sneaky move and called the cops. The alleged soda thief, 48-year-old Daniel Stine, didn't exactly comply with the authorities or the Arby's employee who asked him to pay for the drink, so things quickly descended into a reality TV meltdown of sorts. According to Missoula's KGVO, the Arby's worker followed Stine out of the restaurant and told him he wasn't welcome back. Presumably offended at his sudden banishment, Stine tried to kick the worker, then started walking way again. The Arby's employee called the cops, who showed up on the scene and eventually found Stine hiding in a nearby Denny's restroom, assumedly with his purloined soda in hand. "When confronted by an employee who informed him that he had to pay for the cup of soda he refused and left out one of the entrances. The employee followed him, told him that he was not welcome back then he turned and came back towards the employee and tried to kick that person before walking away again." When Stine was confronted by officers, he acted in a similar manner, approaching them "aggressively" and "resisting arrest," per the spokesperson. Now, he faces a litany of charges including a "felony robbery charge on top of four misdemeanors including Criminal Trespass, Disorderly Conduct, Obstructing a Peace Officer and Resisting Arrest," according to the report. While it's unclear whether Stine will plead guilty to the charges, it remains obvious the man is a fierce defender of freedom and soda.